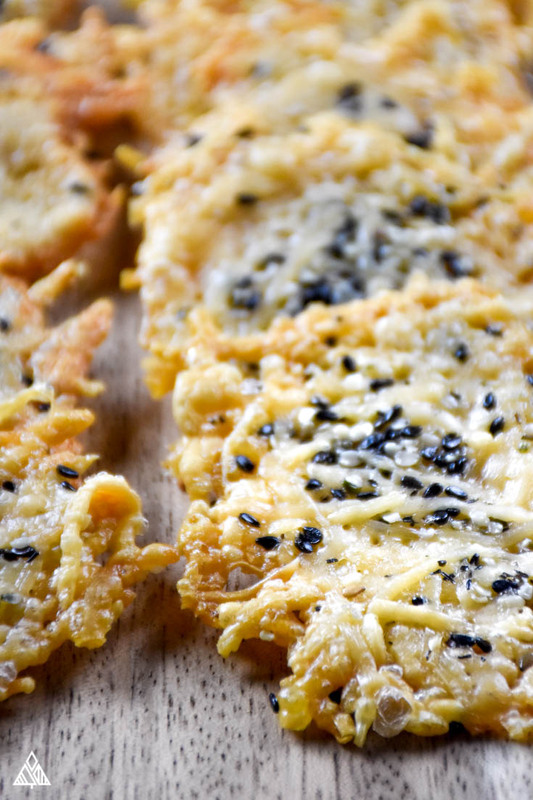 Brace yourself, these parmesan crisps are gonna rock your world. Crispy, crunchy, delicious with toppings or on their own, these bad boys are just the treat you’ve been looking for! 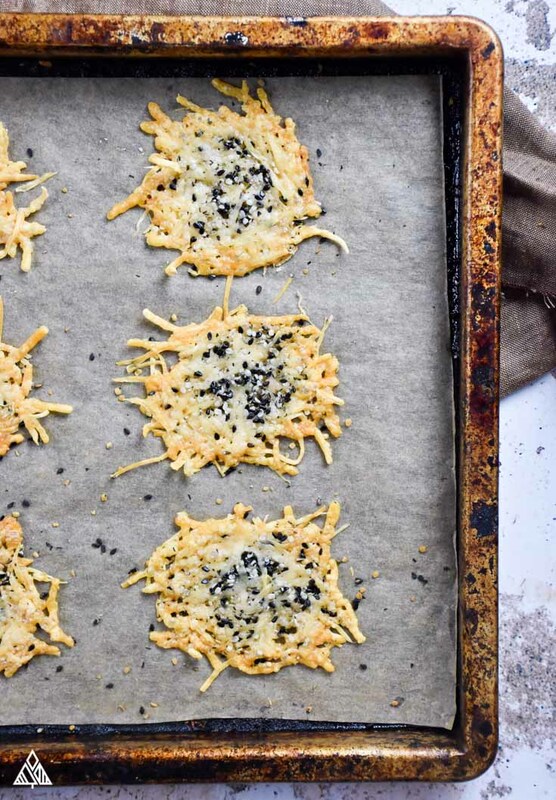 Enter the parmesan crisps Barefoot Contessa herself would be proud of! If you’re thinking this is some sort of makeshift junk food, you’ve got it all wrong. 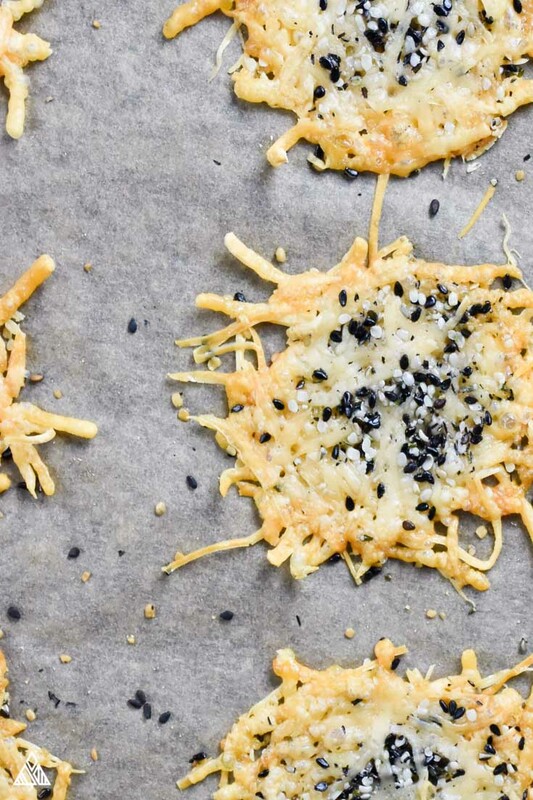 Gone are the simple carbs that haunt your snacks — This recipe is literally just crunchy cheese. Versatile, easy, and dare I say, a little decadent, as far as low carb foods are concerned! Why Parmesan Crisps Are The BEST! 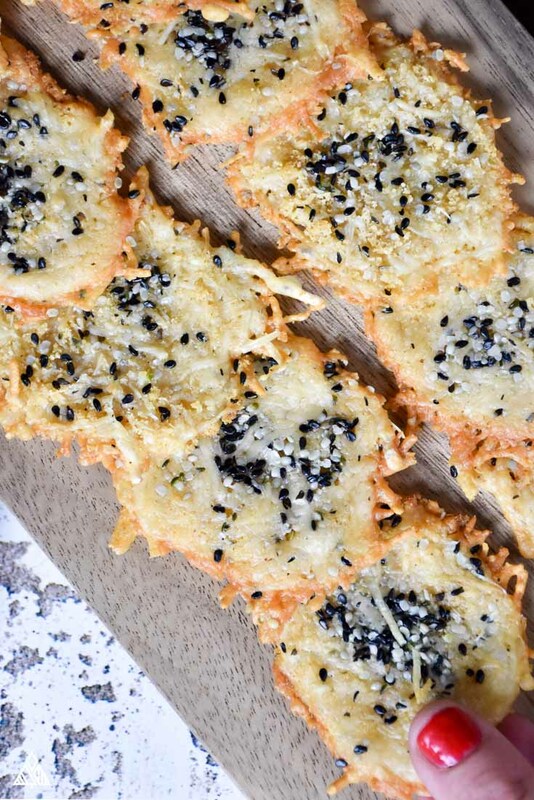 Warning: you wont be able to get enough of these parmesan crisps! Perfect for those looking for new low carb snack ideas or low carb appetizers to serve at your next dinner party. Easy enough to whip up in a pinch when all you have in the fridge is cheese, I love this cheese recipe because it comes with such a satisfying crunch, far crunchier than my favorite low carb crackers. They crumble easily into your low carb meals—soups and salads immediately come to mind—and they’re great low carb snacks on the go! Plus, as much as we all love our veggie chips, sometimes you’d rather save your carbs for the dip instead of those plantain chips, beet chips or eggplant chips. 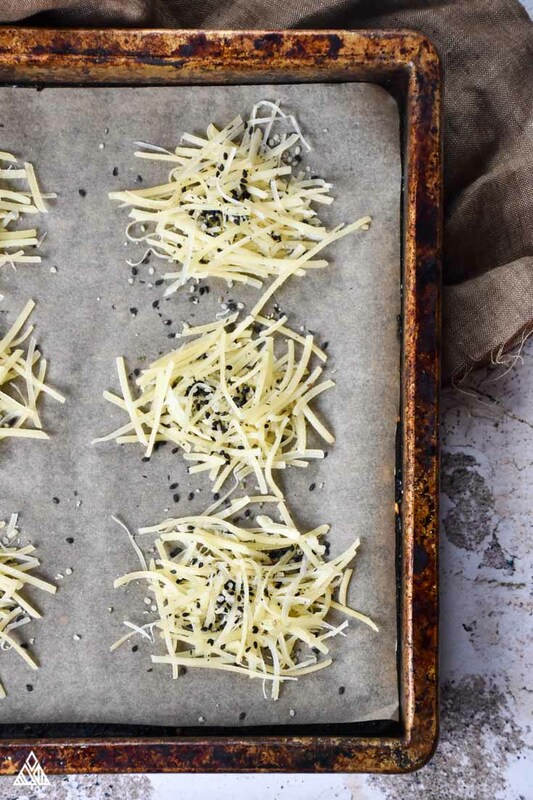 This low carb chips recipe can be as simple as you’d like it to be, as there’s only one required ingredient: CHEESE! On a low carb diet, cheese is a beacon of hope — at least in terms of delicious snack food! Think about it, cheese is primarily made up of fat and protein — and as delicious as it is, there are hardly any carbs in cheese. In fact, if you pick wisely, there can be a surprising amount of protein in cheese — and parmesan happens to be at the top of the list! Some people just place a slice of cheese on a pan and in the oven. Other recipes bake the cheese in a thin, even layer and cut into chips once it has all melted together. My preference is to build small mounds of freshly shredded cheese. For one, when the crisps are done, you’ll get these light, crispy chips with this glorious lacy texture! Make small mounds of cheese—don’t make them too big. Aim for a flat circle shape, leaving some space between shreds—this is how you get that pretty lacy look. Avoid adding too much cheese to the center—keeping a consistent thickness will keep things crispy—no gooey surprises. Leave plenty of space between crisps. They spread out as they bake. How to make parmesan crisps without parchment paper? Easy. Your best option is to use a silicon baking sheet—the chips will slide right off with minimal effort. These keto cheese chips can be dressed up with any flavor your heart desires! There are two ways you can make a personalized version of these cheese crisps: what you mix in, and what you put on top. The only consideration here is — pairings. Cumin and paprika likely won’t compliment a blend of parmesan and asiago, for example, but they definitely give a batch of cheddar chips an extra dimension of flavor. Cheese Chips Toppings — Go Wild! 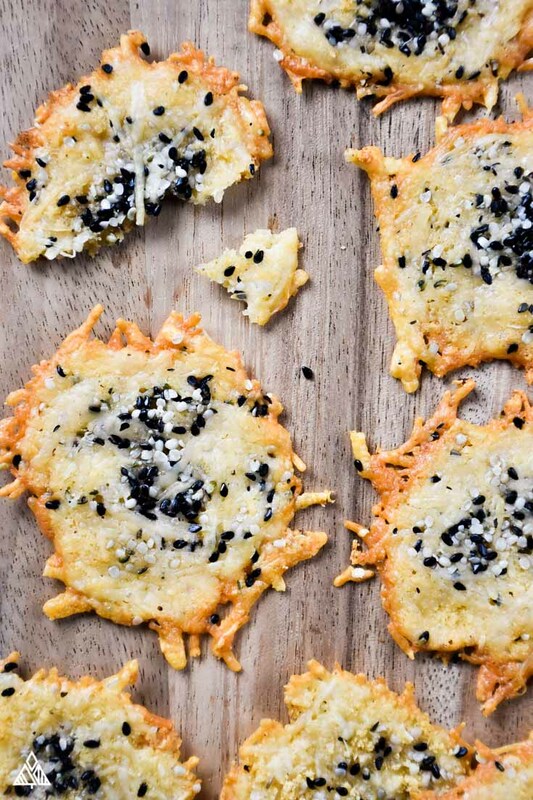 Skip the low carb tortilla chips and turn these into a parmesan crisps appetizer, by smothering them in salsa, grilled chicken and black beans — homemade low carb nachos anyone? 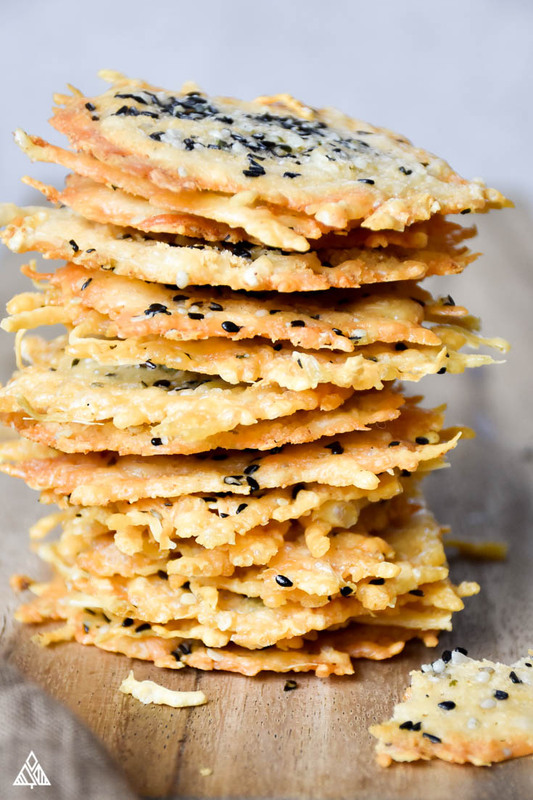 Or revel in the delicate, sophisticated beauty of your savory Florentine crisps. Or, don’t mix or top them with anything, dip them instead! Try my low carb pizza sauce or pesto recipe, you’ll love either choice! Cheese Chips Microwave, oh Yes You Can! The microwave is a polarizing appliance, so the idea of microwaving cheese may be just a tad off-putting for some (I don’t even own one!). But, for the convenience cooks among us, I’m pleased to report that based on many happy recipe testers, you can in fact, make microwave parmesan crisps. For those interested, I’ve seen parmesan crisps Costco and parmesan crisps Walmart sell — but nothing beats homemade! I’m beyond thrilled to be sharing this parmesan crisps recipe with you guys, and can’t WAIT to hear what you think! If you’re interested in exactly how many carbs you’ll be saving, check out the parmesan crisps nutrition below! 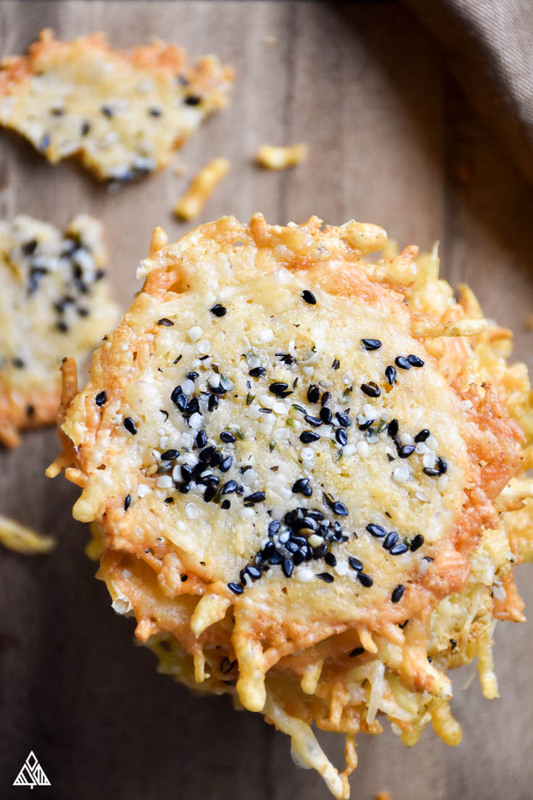 This Parmesan Crisps recipe is literally crunchy cheese! I'll show you how to make it, plus 5 DIFFERENT WAYS to spice up your new favorite low carb chips. In a bowl, stir together parmesan cheese, garlic and onion powder until combined. In a separate bowl, combine the seeds. Sprinkle the seeds on top of each mound of cheese.